Just because you may have outgrown your Legos and Erector sets does not mean the fun has to stop. Introducing RotorBits, the modular construction set of endless possibilities. Based on the idea of standardized connections and dimensions, the only limit to what can be built is your imagination. 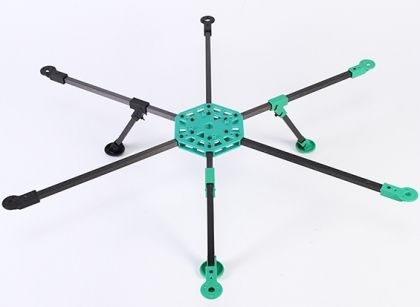 The RotorBits HexCopter is an ingenious adaptation of the RotorBits modular parts, to create a unique simplistic take on the workhorse of multi-rotors. Using other Bits the Hex can be adapted to fill many rolls and tasks with its increased payload ability. The carbon arms and glass filled nylon molded parts makes this as durable as it is simple. The brightly colored Hex center plate has 45x45mm integrated mounting posts for the flight controller and various provisions for adapting other accessories and bits. The landing skids have a zip-tie breakaway design and moon lander rounded cup feet for ground skimming fun. The simplistic modular idea makes assembly a snap, bringing fun back to a sometimes over-complex idea. RotorBits components can be interchanged between multiple projects, allowing you to mix and match to your hearts content! As your collection of Bits grows and concepts evolve, youll find that the possibilities are endless. Who knows what youll come up with next! RotorBits is an idea that can never be outdated, only reconfigured.